Let’s think about painting this week. And in particular Maaike Schoorel, whose fourth show with Maureen Paley opened a few days ago. Originally from the Netherlands, educated there and in London, Schoorel is having a big solo retrospective at the Gemeentemuseum in The Hague later this year. Rather than addressing the show itself, the press release for Sub-Lo quotes at length from a Wikipedia entry devoted to psychologist Jerome Bruner’s theories of perception. The artist’s enquiry through her work into the physical processes of looking recalls some of the more forensic art historical analysis of the paintings of Bridget Riley. But let’s think about the paintings themselves. The opening gambit is Lisa in the Bath: the composition as usual drawn from source photographs taken by the artist, typically featuring close friends. The work also unavoidably recalls the work of Pierre Bonnard. 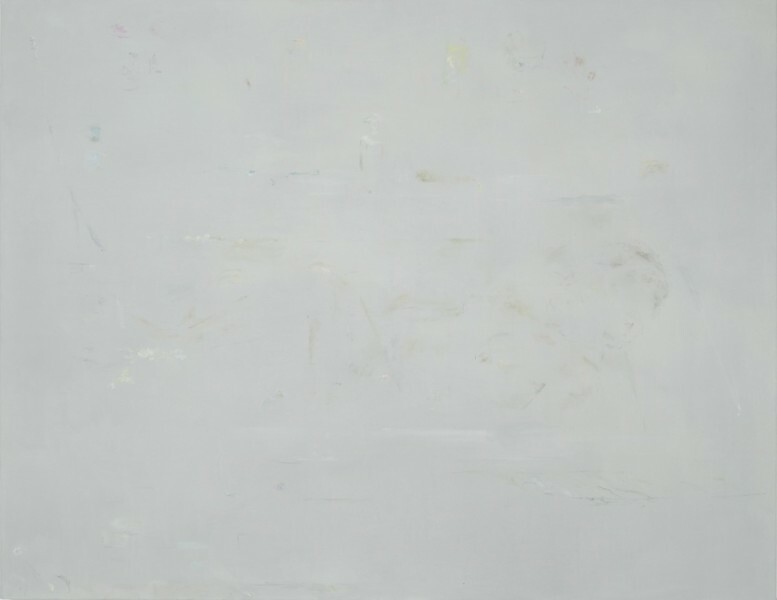 Vestigial pencil marks – like secret hieroglyphics – and the occasional impastoed dab insist on the physicality of the painting itself, while the eye adjusts to the barely-there technique that is Schoorel’s trademark. We are made to work hard to grasp the subject and with each successive canvas the titles are triggers that help us to resolve the slender, painterly clues into fully achieved pictures. One is keenly aware of the tension between the visual and the verbal apprehension of the subject. The visual vocabulary of the bathroom emerges slowly from the filmy paint – the banality of a pump-action shampoo bottle – and the overwhelming intimacy of the subject observed naked, contemplative, by the invisible artist. The watery theme is to the fore in the painting that faces Lisa in the Bath. Waterview Silodam is a landscape view, an unusual subject for Schoorel who tends to concentrate on interiors and portraits. Here it is the view from the window of a borrowed apartment in Amsterdam. The sun’s milky reflection in the water of a canal is armoured around with masts and trees. 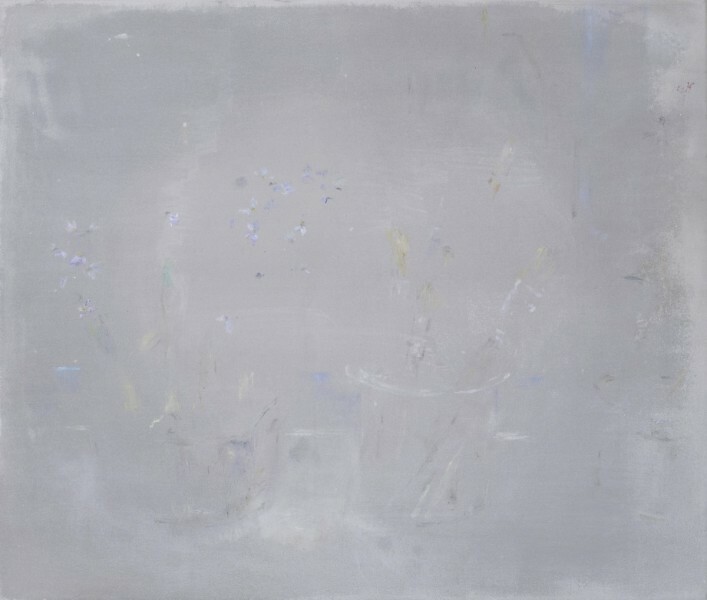 The pale northern light of March, the infinitely liquid quality of the image that trickles into abstraction – this is territory much explored by painters for a century and more. Schoorel makes it her own, without self-conscious quotation or ironic posturing. An intense little diptych of candles expands the metaphor about the mechanics of looking, with subtly different viewpoints of the same object, as if produced by the optician’s trick of covering one eye and then the other. Studio has the painter’s chair planted squarely in the centre of the space in a face-off with the canvas leaning on the wall opposite. The chair’s isolation bespeaks the intensity of the challenge faced: one senses the painter interrogated as penetratingly as if it were the famous black leather Mastermind armchair, or a witness stand. The candid eye of the artist gazes coolly from the self-portrait Selfie with rabbit in the first floor gallery. And here the watery leitmotif continues with the very extraordinary Standing in the lake. 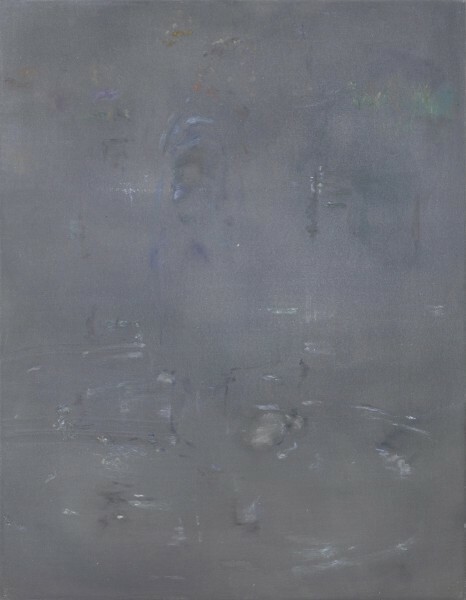 Something in the palette of greys and bruise-purples, combined once again with the existential isolation of the central figure – here atypically male – triggers a stream of visual memories of early 20th century paintings. (I will let you fill in the names.) There is an engaging absurdity in the figure standing in a lake, without fishing rod, or boat, or other visible explanation for non-standard behaviour. This is serious, seriously accomplished painting with an evolved personal vocabulary. Very highly recommended.